For more information on this trial click here. Roche Pharmaceuticals sent a letter to the global HD community to provide an update on the design of the GENERATION HD1 study. 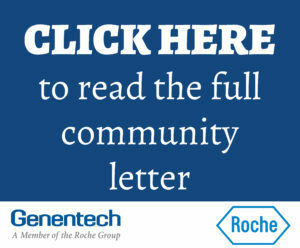 You can read the full letter from Roche here. 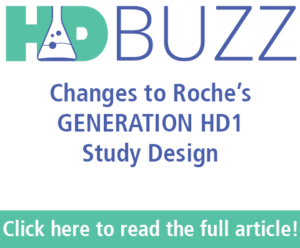 HDBuzz has also published an article on the study design change. You can find that article here. The study arms involving treatment every two months and placebo will remain the same. The study arm that tests monthly treatment of RG6042 will be replaced with one that tests a less frequent dose of once every four months (every 16 weeks). Roche made this change after a review of the nine-month open-label extension data that supported the exploration of less frequent dosing. We believe that this is positive news for the HD community as the design changes will make study participation less demanding for patients, their families, and healthcare providers. For the individuals that have already started the GENERATION HD1 study, you will have the option to move to the open-label extension study. Roche also informed us in their letter that there will be a brief pause in recruitment while the new study design is approved. For our family members, if you have specific questions about these changes or participation in clinical trials we recommend that you contact your local neurologist, Movement Disorders or Huntington disease clinic. We will continue to stay in touch and keep you updated. For the full history of updates on this trial, click here.